These prosciutto wrapped prawns have actually been shown in a previous blog post but I took it down. Most of you probably don’t know about this because it was just an experimental idea when I started blogging. But I tried to do a series of posts where I would pair food with a cocktail. For example, Tomb Collins with a scallop appetizer, or Gin and Tonic with the prawns I am showing you today. After about 5 of these posts, I realised how disinterested people actually were whenever I uploaded them, which is understandable. I mean, nobody really goes out of their way to pair food with a cocktail, they just have one or the other. So what I did was edit those posts to only show the pictures and the recipe of the cocktails themselves. This ended up being much better, however, the recipes that I paired with the cocktails were still really good and it would be a shame to just discard them. So I decided to expand on them instead and upload them as their own posts. I have to say, I quite like the idea of making these prawns as an appetizer. I am sure we have all experienced going to peoples houses for dinner and they stress out about the food. 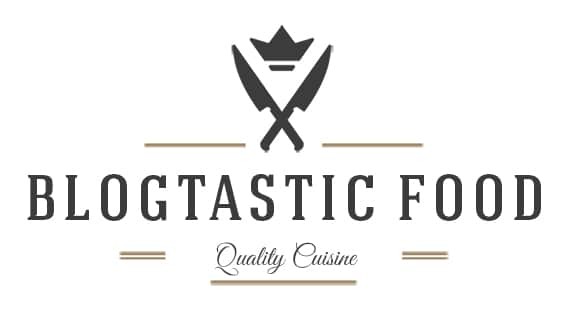 Worrying about getting it ready on time or whether something is cooked right or not etc. These prawns are great to serve before the main course because they are quick and easy to prepare and cook. You can also make the dip in advance which makes your life much easier. Oh, and they taste fricken awesome, the saltiness left on the guest’s tounges will only make them crave the main course even more. Which is what you want right? Thank you for reading through this post and checking out the recipe. Let me know how it all goes if you decide to make it. Stay awesome and take care. 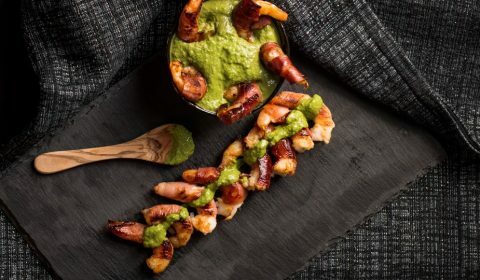 These prosciutto wrapped prawns are great to serve to guests as a starter, leaving them wanting more. Put all 7 ingredients for the dip in a blender, along with a pinch of salt and pepper. Blend for 1-2 minutes until you have a smooth consistency. Keep in a bowl or container, covered in the fridge until you are ready to serve. Cut the prosciutto into long thin trips. 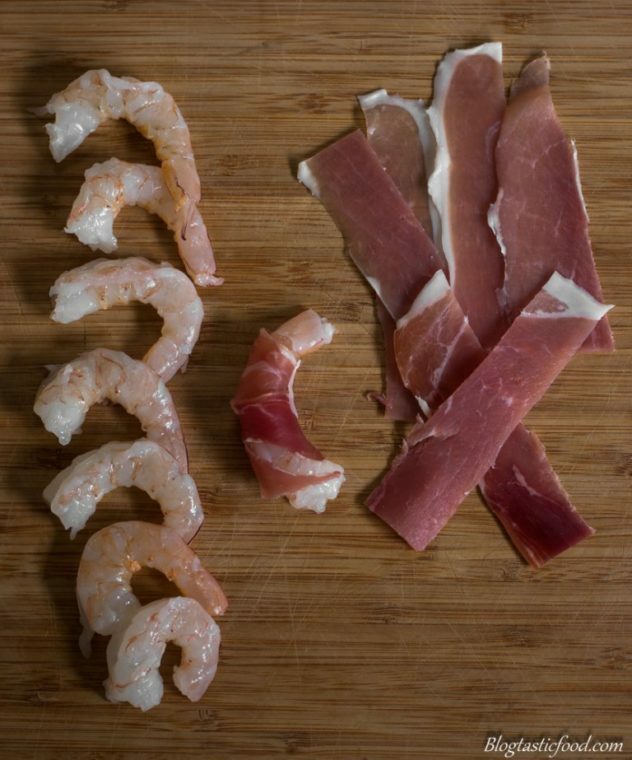 Wrap the prosciutto around the prawns (one strip per prawn) and then set aside. Get a couple of sheets of baking paper on a plate. Pre-heat a pan on medium-high heat. Add a glug of olive oil and then fry the prawns for about 1½-2 minutes on each side. Keep an eye on them as the prosciutto can burn quite easily if your not careful. Turn the heat off and the transfer the prawns on the baking paper to drain. Serve with the dip and enjoy. If you like prawn dishes, you may also like this Teriyaki Prawn Skewers recipe. These really look tasty! I think you solved my appetizer problem for tonight! 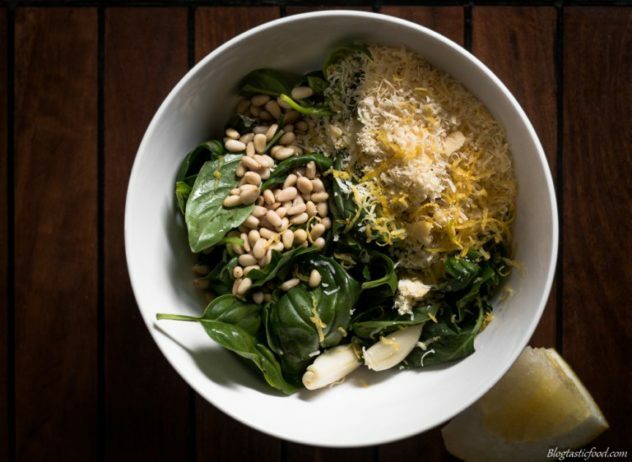 Very interesting pesto with the lemon juice and zest! Probably really nice with the shrimp! 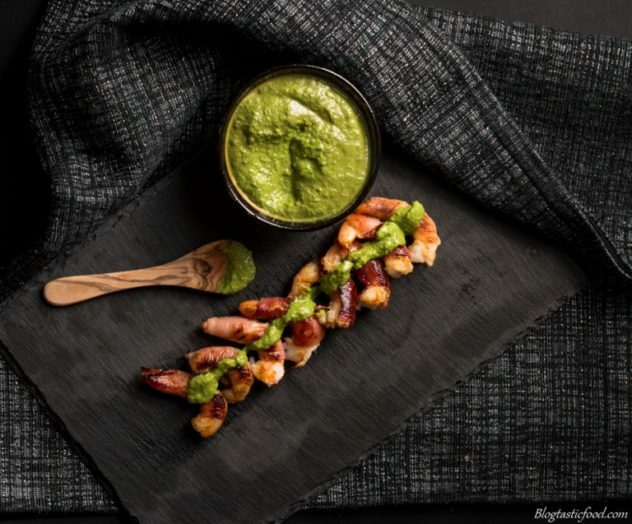 I like the smooth lemony pesto and the prosciutto wrapped prawn. What a tasty appetizer. Looks tasty definitely to try. Great post and recipe. Definitely love almost anything with pesto!! They’re beautiful Nick!! What an elegant start to a meal. Wishing we could drop in to your house to try these!! thanks for the recipe! Looks delicious! Can’t wait to try it. I’m also enjoying your fabulous photos. And personally, I wouldn’t mind seeing the cocktail that accompanies the appetizer. Speaking of, what appetizer would you make for mohitos?